Marguerite Hutchison, 86, of Winner, SD passed away on Saturday, Sept. 8, 2018 at the Winner Regional Healthcare Center in Winner. Funeral service were held on Thursday, Sept. 13, 2018 at 10 a.m.. at the Mason Funeral Home. Burial followed in the Winner City Cemetery. 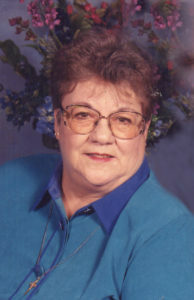 Marge was born Aug. 31, 1932 at home in Hamill SD to Bruce Herman and Minnie (Mundlein) Herman. After graduating High School in Chamberlain, she was married. From this union Terry Lee was born. On Aug. 23, 1958 she married her true love, Robert Hutchison. To this union Robyn Elise and Jeffrey James were born. They eventually made their home at the ranch along the White River south of Presho. Marge enjoyed her life on the ranch tending the cattle and helping put up hay. She always had a very large garden. Marge taught Sunday School many years at the Community Bible Church in Presho and was also active in her local Women’s Bible Study. After moving to Golden Prairie Manor, she still grew tomatoes on her patio every summer and loved to play cards every day. Mom leaves us with many fond memories and we will always remember the story of when Bob ran over her with the 4-wheeler during calving. Marge leaves a legacy of hard work and the true love she always had for Bob. Brianne, Jesse (Timmi), and Cody (Brooke). Great grandchildren; Caelyn, Claire, and Dashel. One sister Norma Johnson; Sister-in-laws Twila Herman and Lois Warner. Many nieces and nephews. She was preceded in death by her parents, Bruce and Minnie, husband Robert, brother Raymond, brother-in-law Miles and one great granddaughter.